After creating a custom form, how do you save and use it? You have two choices: you can use the File, Save as menu and choose Save as template (*.oft) in the file system or Publish it to a folder in your mailbox. Which method you choose depends on the form. Simple forms can be saved as templates anywhere on the drive. You can double click to open them or copy them to a folder in Outlook for easy access. Forms with custom fields need to be saved in the default Templates folder and opened using the Choose Form dialog. See How to Open Outlook Templates using Toolbar Buttons if you want to create a toolbar or ribbon button to open these forms. Forms with code behind them need to be published. Instructions to publish forms and delete republished forms follow. You can also change the icon. The default forms icons are stored under the FORMS folder in your Office installation; by default it's C:\Program Files\Microsoft Office\OfficeXX\FORMS\[lang-id]. To publish a form using Outlook 2007 and up, select Publish on the Developer ribbon. If you are publishing a new form for the first time, either Publish or Publish Form As will do. Use Publish Form As if you want to publish a custom form using a new name. Enter a name for your form. You can use spaces in the name, however I prefer not to. The default location for non-mail forms is Outlook Folders. This saves the form in the default folder for the item type. You can choose another folder (of the same type), if desired. When forms are published to the folder, you can select them from the Actions menu (older versions) or from the New Items > Custom Forms button. In the open item that you want to publish as a form, choose Tools > Forms > Publish Form. In the Publish Form As dialog box, use the Look In list and Browse button to select the location where you want to publish the form. Give the form a Display name, which will be used to select the form from the folder menu or forms library, and Form name. 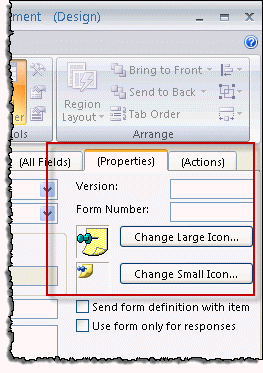 On message forms, Outlook will pop up a message suggesting that you check the Send form definition with item box on the form's Properties page. You should answer No to this prompt. Answering Yes will cause all items creating with the form to one-off, which means that the code behind the form will not run on machines with the Outlook Email Security Update. After publishing, the form is installed and ready to use. While users of any version of Outlook can save, publish, or share custom forms as FDM files, most people will share custom forms as template files (*.oft). However, a bug in Outlook 2013 prevents users from saving some custom forms as templates (*.oft). In order to save a custom form in Outlook 2013, you need to publish it then save the published form as *.fdm file. To save the published form as a FDM file, open the File, Options dialog, Advanced, and click the Custom Forms button, then Manage Forms. Locate the form you want to save, select it and click Save as. Repeat the steps to install a form: open File, Options, Advanced. Click on Custom Forms, then Manage Forms. Click Install then browse for the form. Note: some forms will need to be in the default *.fdm location, %localappdata%\microsoft\outlook, to install. While this is a few more steps than are necessary when you use a template, Outlook 2013 users can use this method to save custom forms to an Exchange server's Organizational Forms Library, as the Organizational Forms Library is not available as a Publish to location in Outlook 2013. 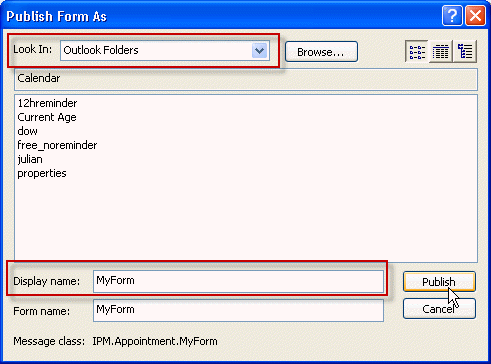 Personal Forms Library of forms stored in your Personal Folders or Exchange Server mailbox. Organizational Forms Library of forms stored on the Exchange Server for group use. You need permission from the Exchange Server administrator to publish to this library. Folder Forms Library of forms associated with a particular folder, either in your mailbox or Personal Folders or in a public folder on the Exchange Server. To remove a published form in Outlook 2010 and up, choose File > Options > Advanced > Custom Forms > Manage Forms to access the Forms Manager dialog. In Outlook 2007, 2003 or 2002 choose Tools > Options > Other tab > Advanced Options > Custom Forms > Manage Forms and use the Forms Manager that pops up. Click the Set button and select the location where the form is published. Select the form and click Delete. For more information on distributing forms, see How do I distribute Outlook forms to other users? We have a knowledge base published on an http website. The pages have links on them for the OFT templates. Clicking the link launches the template as an .msg in outlook 2013. The problem we are having is the "From" field changes to the default account instead of the shared account/desired mailbox. In the From field on the OFT template when published, it has the shared mailbox email address,not the display name. All analysts that launch the http link have the shared mailbox added as an account in their outlook profiles. Is there way to keep the From field in the template when launched from http links? The only way that ever worked was saving it with the same display name as used in the profile. For a shared mailbox, this would be the display name,not email address. I have used Developer in Outlook 2010 to create a template for use on my manager's calendar. With the upgrade to 2013, when I try to use the template it has changed the organizer to me and puts the appointment on my calendar instead of my manager. Something has changed in going to 2013 but I can't figure out what. An suggestions? You set the from field to be the manager in the template? Is the account name (as it appears in outlook) the same? That is usually the cause of forms with preselected accounts no longer working. Older versions of Outlook used the display name for the account name, outlook 2013/2016 default to the email address. I did not set the 'from' field. I don't use Design A Form. Can I 'set the from' in creating a meeting? I had created the meeting on my manager's calendar and as with other meetings not saved as a form - my manager was listed as the meeting 'organizer.' It is only after I Published the form was I listed as the organizer - not my manager - and when sent, the meeting then hopped to my calendar. I have recreated the form, Publishing with a different name, placing it in my Personal Forms Library - with the same result. I don't understand your question: "Is the account name (as it appears in Outlook) the same. All the names, including the addressees appear as their display names - not Jane.Doe@acme.com. >> I don't understand your question: "Is the account name (as it appears in Outlook) the same. All the names, including the addressees appear as their display names - not Jane.Doe@acme.com. in some versions of outlook it is display names, newer versions use email address (but upgrading in place keeps it the way it was). if you save a form with an account name set and that account name doesn't exist in the profile, it uses the default account. I will see if i can repro and come up with a solution. We work in Outlook 2013 and have loaded a custom form to the Organizational Forms library but it will not let us Publish it. What might we be doing wrong? It's a bug (or a product change) - you need to save as a form and install it. we have forms saved in Organisational form Library on exchange server - when we modify/change the form after republishing it those changes aren't saved. not on the Compose page and not on the read page in developer mode. Any idea why? One aspect of custom forms that has always frustrated me is that when publishing the form, it appears to lock the body format. So even if you change the default body format via "Compose messages in this format:", the form will always use the format that it was published in. You can still change the body format using the Format Text options from within the Inspector Ribbon, but your configured default is ignored. If the custom form was in HTML during creation and you publish it, every time you compose a message with that form the body format is always HTML. If the custom form was in Plain Text during creation and you publish it, every time you compose a message with that form the body format is always Plain Text. If the custom form was in RTF during creation and you publish it, every time you compose a message with that form the body format is always RTF. This has been a problem since Outlook 2007, and it still a problem in Outlook 2016. The only solution is to create the form as an .oft file using Outlook 2003. Unless there is another solution that I am unaware of? Correct - the format is set when you publish the form. You can change it manually, use and oft, or put code behind the form to change it on open. I want to delete a custom form I've published, that I have published in "inbox" not "Personal Forms Library". When I go to delete the form from: options/advanced/custom forms/manage forms it doesn't give me an option to delete from "Inbox", only "Personal Forms Library" where it is not saved, thus have no option to delete. Any information you can provide on where I can find this form to delete, would be appreciated. Is there a Set button? Click it then select the inbox folder. I have an outlook custom form developed under outlook 2010 but we have recently migrated to office 365 (cloud) and the code no longer runs. I can publish visual changes to the form but none of the code runs. what did I do wrong? I tried the old way (publish the form to the folder which in a public folder). I tried the "Save as or Install *.FDM" method described above. NADA. Help? In file, options, trust center under email security there are options for running script in public or shared folders. they need to be checked. We have a custom form saved in our Organizational Forms Library. We fill in the blanks and hit the SEND FORM button that is built into form and it sends messages to everyone in IT. We want to create a second form that is used for different announcements so we have opened and designed this form and published as a different name in the same library. We changed who we are sending to and the name on the button but now it won't send. It prompts for us to choose from the Global Address Book even though the name is clearly displayed in the TO field. What happened? What did we miss? does it have the name in the address field or an alias / email address? Was the name resolved (underlined)?